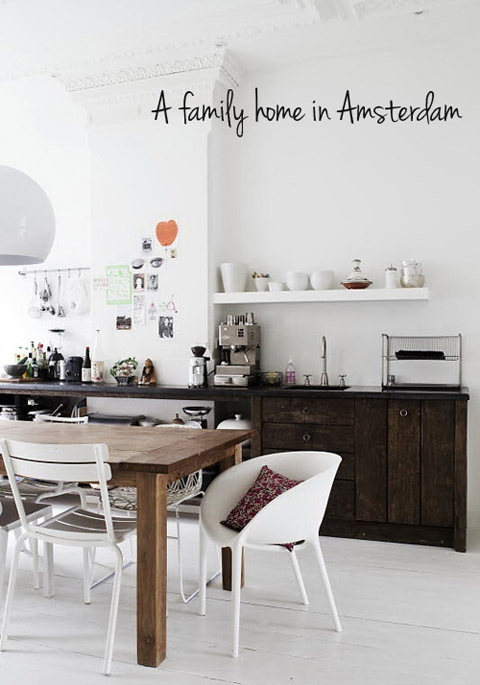 Some posts ago I was sharing here yet another inspiring home in the Netherlands, located in the charming city of Amsterdam, while expressing my desire to be there again for the…6th time! The time has come and just a few days before my flight there, I’m already in the mood for exploring more fabulous domestic environments in the lovely city of canals. Today, we go through the rooms of a family home, literally bathed in light, thanks to its traditional high ceilings painted bright white – just like the walls and the wooden floors – and the many large windows. Starting our tour from the heart of this home, the kitchen, I admit to it being my most favorite place throughout the whole house. I particularly love the simplicity and the lightness the absence of high cabinets mounted on the wall bring. Instead, the owners went for dark, antique wood cabinets topped with a natural grey stone working surface. A cooking corner by one of the room’s two beautiful, arched windows, spices, a white shelf displaying white porcelain and glass, a rectangular wooden table and a joyous, harmonious mix of chairs grouped together with their color white as a basis. Add a huge bubble hanging lamp and the scenery is set for delicious cooking and dinners bringing together friends and family. Bliss. 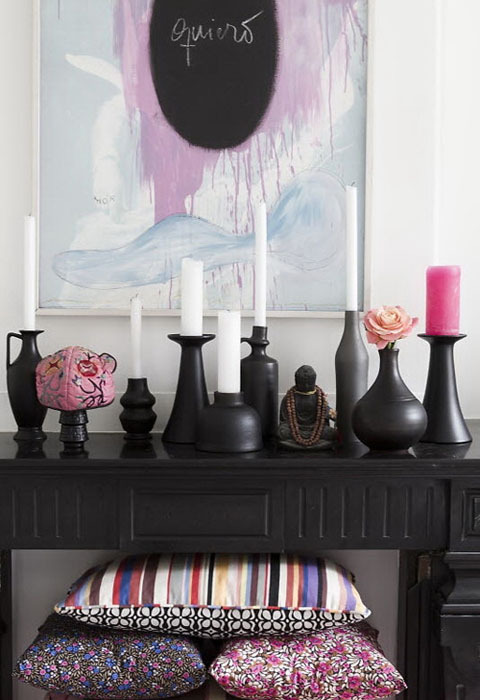 For more of it, meaning bliss, one has to simply pass through the French doors to the living room and sit on the inviting Ikea sofa just opposite the charming black mantelpiece, where ceramic vases and candle holders in grey tones set the atmosphere. A colorful rug, blankets, throws, pillows and cushions add texture, interest and color, while promising relaxing times. 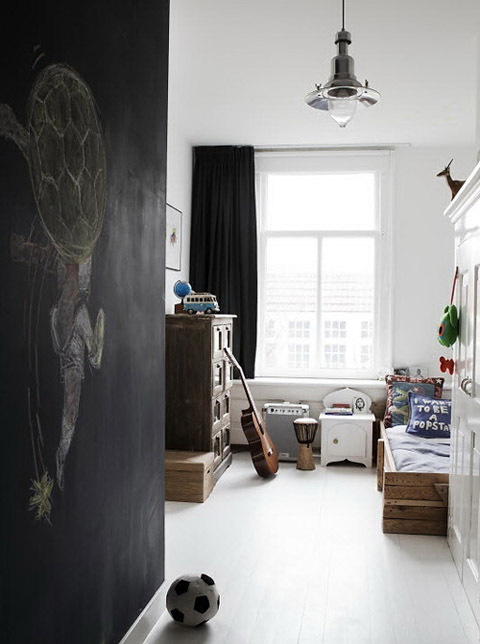 The children’s rooms are nothing short of amazing and super stylish with the blackboard wall and the “I want to be a pop star” pillow in the boys’ room catching my attention, while the newspaper dress hang on the wall above the girl’s pretty bed totally blows my mind… It’s the little details, it’s lots of love, care and attention that bring a family home – and every home in fact – together.